Dimensions: 5.5" X 8.25" X 1.25"
The Rev. 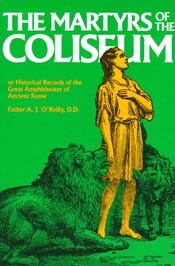 Father A. J. O'Reilly, D.D., was a priest and author of the nineteenth century. His The Martyrs of the Coliseum, or Historical Records of the Great Amphitheater of Ancient Rome chronicles the miraculous faith and passions of such holy men as St. Ignatius of Antioch, Pope St. Stephen, St. Alexander, and many more. Father O'Reilly's work was published in 1875 by D. & J. Sadlier and Company, New York, and recommended to the faithful by the Rev. John Joseph, then Archbishop of Toronto. It was also printed by TAN in 1987 with a purchased typesetting.